Net Zero Homes are 70% more energy efficient than typical homes. They are often powered by solar and built using Insulated Concrete Forms. Known in the industry as ICF Construction. There are many benefits to this type of construction. Net Zero Homes have zero utility bills! ICF Construction offers virtually no air leaks, which reduces heating and cooling costs associated with drafts and leaks. Noise absorption is also phenomenal with this type of construction system. ICF walls have minimal acoustic transmission and standard thickness ICF walls frequently produce sound transmission coefficients (STC) between 46 & 50. 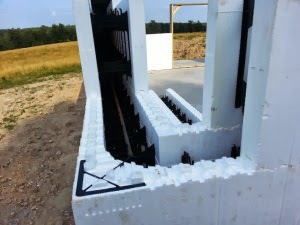 The strength of ICF walls can be compared as 10x’s stronger than traditional wood framed walls. Joshua Deatherage Builders LLC, purchased Preferred Energy a solar company in 2014. Together we have the expertise to build your Custom Net Zero Home.